The Pacific Ocean makes for a pretty cool aquarium! Here you see (top) a Palette surgeonfish (Paracanthurus hepatus), next is a Reticulated dascyllus (Dascyllus reticulata), and immediately underneath that is the prize of this photo: Lemonpeel angelfish (Centropyge flavissma) are notoriously difficult to photograph. They just keep darting in and out of the coral, never giving more than a fraction of a second to snap the shot. 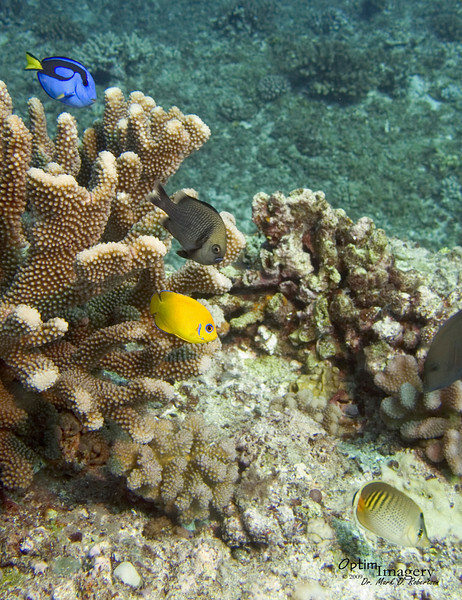 Bottom right, you see a Spotbanded butterflyfish (Chaetodon punctatofasciatus). NIce shot! Lemon peel looks like he is posing to me!